Our fir is all grown on local plantations with almost no fertiliser or pesticides. 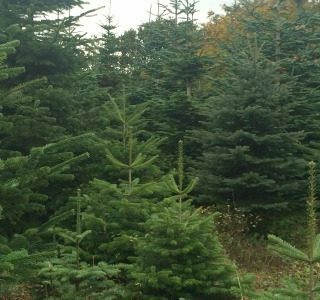 Noble fir is grown to biodynamic/wild standards; Fraser, Korean and Douglas firs and all pine varieties are grown to organic standards. Nordmann fir is grown to conventional standards. We source the eucalyptus in our wreaths and garlands direct from a small local plantation on the edge of Dartmoor which is managed to biodynamic standards. 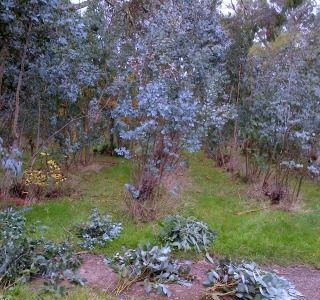 It is a plantation with a very diverse range of eucalyptus trees which supports many wildlife species. We use the best varieties, cut every few days so it reaches you as fresh as possible. We mostly use the varieties cinerea, elliptica, glaucescens, gunnii, neglecta, urnigera, perinniana, pauciflora and pulverulenta. Our holly and ivy is wild, foraged by us from our own and neighbouring fields, hedges and woodland. We only take a small quantity from each place, allowing wildlife and the hedges to thrive. 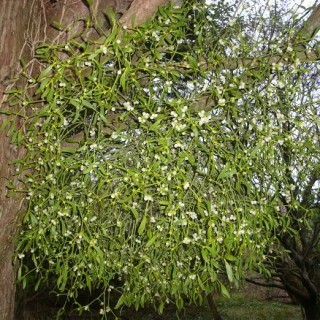 Our mistletoe comes from traditional apple orchards in Somerset and is managed to organic standards. The willow for our wreaths is also organically grown nearby on the Somerset levels in a very species-rich wetland which has been growing willow traditionally for many centuries. Our beautiful large fir cones come from the garden of an English country house. Our ribbons are British as far as possible, sourced from textile mills in the north of England. We love supporting British industry and feel it is vital to do so. Our dried fruit and cinnamon is sourced from our local wholesaler and is British as far as possible. The gold and silver paint and glitter sprays are also manufactured in the UK, and so are all of our florist sundries such as pruners, pins, tape and wire. The small wire wreath frames come from a British company and the large wreath rings for bespoke sizes are made locally for us by a steel fabricator 0.5 mile from our workshop.